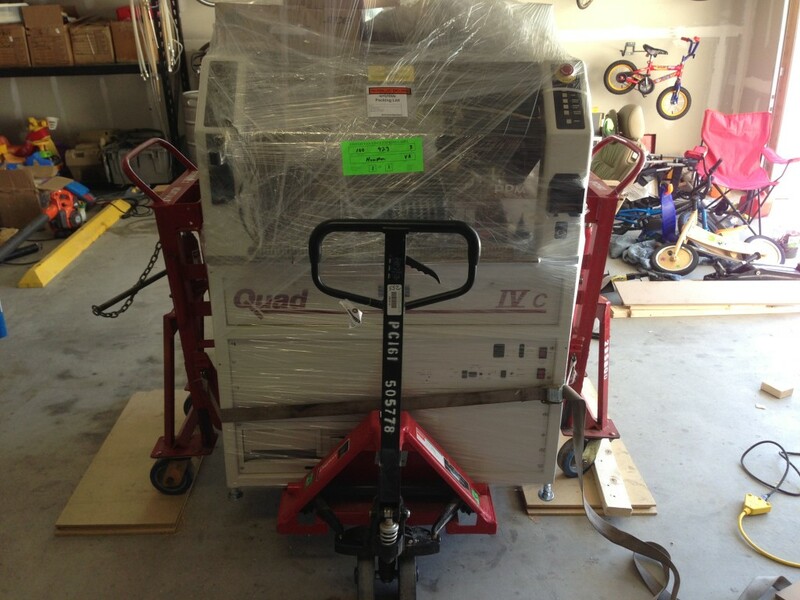 On April 3, 2013 our Quad IVc pick and place showed up for final delivery from PPM. I am going to detail the rational for this purchase and several considerations that you should think about when installing this machine. We chose to go with this machine for a number of reasons. Mainly, I have been eyeing a pick and place for awhile. I am working on a new product line of led based products and due the nature of these designs they require repretitive placing of parts. Our initial offering requires 64x leds and 64x 0603 passive capacitors. That’s 128 small parts that can be hand assembled and reflowed in 30-40 minutes. I have plans to develop boards with up to 256 leds and 256 caps. There is really no way I can viably offer such a product and perform in house prototyping and small run manufacturing. I recently look at outsourcing assembly of these products and after years of paying Non-Recurring Engineering fees (NRE) I finally decided to take the plunge on a PnP. I was seriously entertaining the Taobao TM220a but decided against this machine mainly because of the lack of vision or part alignment. I looked at a number of options; mainly from Madell Tech and Manncorp for new machines as these manufacturers quickly pop up on Google searches for SMD Pick and Places. Cost to get into a machine with a 12″x12″ working area and vision is on the order of $30K. This was a bit above my price range and I started my search for other options. After posting on Twitter for insight into PnP recommendations the folks at Autosport Labs provided a recommendation to checkout the PPM Quad IVc. 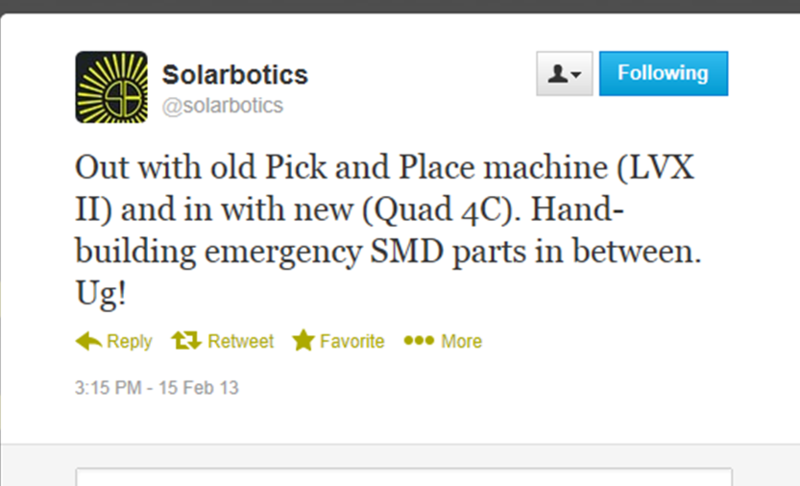 It also turns out that Solarbotics seems to be running a quad machine as well! Knowing that others in the same boat as us are running successful products with these machines. PPM has a really unique business model. Hopefully, I get this right, but basicallly the Owner and Co-Founder used to work for/with Tyco Electronics who manufactured the Quad SMD manufacturing equipment line in the 1990s. Tyco was looking to get out of this market and offered to sell the brand to the PPM founders. 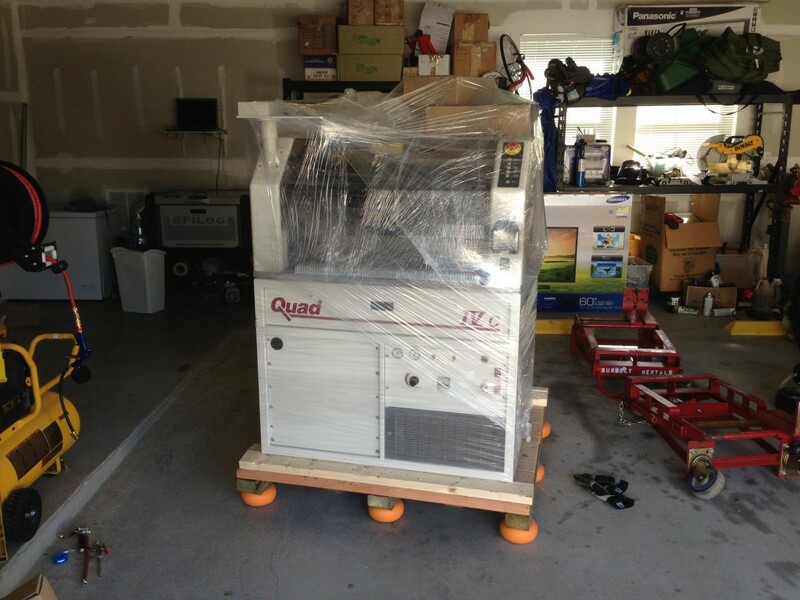 Now PPM purchases and refurbishes the Quad equipment line for resale. In addition, they have made signficant efforts to upgrade and replace the DOS based controls of the original equipment with Windows XP and they are working on a Windows 7 version as well. 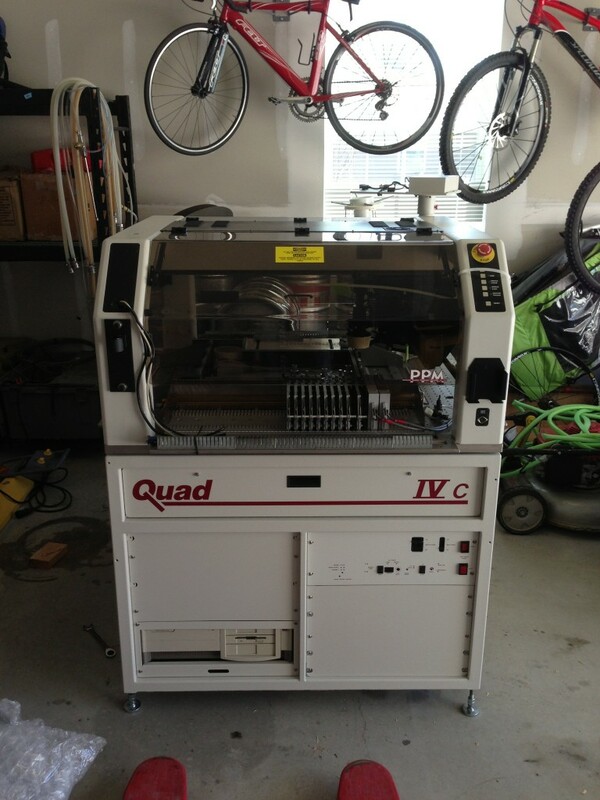 Due to budget constraints I could only consider the DOS Based Quad machine at ~$16K (no feeders). For this price I got a machine that had been thoroughly gone through and checked out to be fully functioning. You can opt for PPM’s Windows XP machine for around ~$28K. This option gives you the opportunity to using CAD based sentroid data a lot more easily than the DOS machine. Luckily, I am pretty good at scripting languages and have adapted a work flow to use CAD data without having to teach my Quad all the placements. You can purchase some of these DOS based machines at auction or consignment for $10K, but they are usually sold as is. I made a conscience choice to go with PPM knowing that my machine would work and would be supported for 1 year under warranty. I spoke with many folks who highly regard these machines for the high service reliability. They were and still are considered to be manufacturing workhorses. They possess linear guide rails with ball screw motors and have ridiculous beefy parts throughout. The machine is built around a 1″ thick steel table that is surrounding by an equally beefy tubular steel frame. Definitely high quality manufacturing that shows in its design and weight. This thing weighs 1300 lbs and is truly a beast to maneuever. Many of the critical wear items have been replaced and certified by PPM’s technicians. PPM was also very willing to configure the machine for just the setup that I needed. Their customer service in this regard was top notch! I ended up with 2x12mm feeders, 8x8mm feeders, and a matrix table to handle all the components I plan on placing. Altogether, I was able to procure this full functioning machine, spec’d to my desires, with feeders and training and shipped to my door while staying at my $20K budget. PPM highly recommends coming to their facility and spending time with their technicians to get trained up on your machine prior to its delivery. I ended up visiting PPM at their home base in Fremont, New Hampshire and worked closely with Mike Wylie for the better part of 6 hours on the basic operation and setup of the machine to run one of our prototype boards. In doing so, I was able to learn the “tips and tricks” to making this machine run. I have operated a lot of different types of manufacturing equipment, but never a pick and place. With his guidance and reference to the manual getting the machine up and running was not a problem. 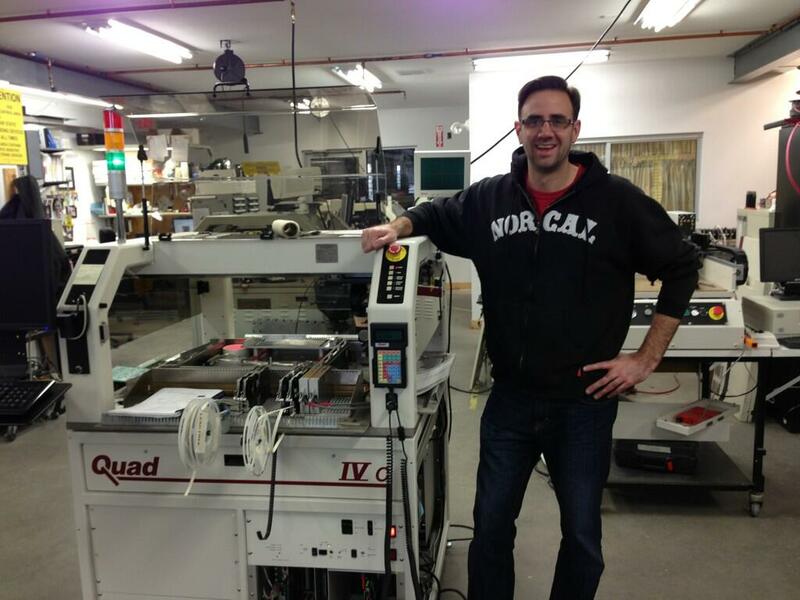 Luckily, Mike made sure that all the required “factory calibration” was current and up to date for this machine. With our training complete, it was simply a matter of time for Mike to finish the final details on our machine and ship it to us for final installation at out facility. I made sure to coordinate with PPM and the shipping company to insure that our machine arrived on a trailer that was equipped with a lift gate. I do not have a forklift and even if I did, it would not make it into the residential garage where the Quad will resign. With the lift gate I could use a simple pallet jack to offload the Quad and roll it into place. Below you can see the Quad on its pallett and these handy vibration isolation pucks. Due to the isolation pucks I had to use these “roll-a-lifts” to lift the quad unit off its pallett and then lower it into place. Luckily, a local rental equipment company was able to provide these for $75 for the day. Here you can see that we have removed our pallet, that had been insanely secured to our machine, and the machine mounted in its finally place of installation. Now that our machine is installed I am now up and running with prototype led matrix boards. 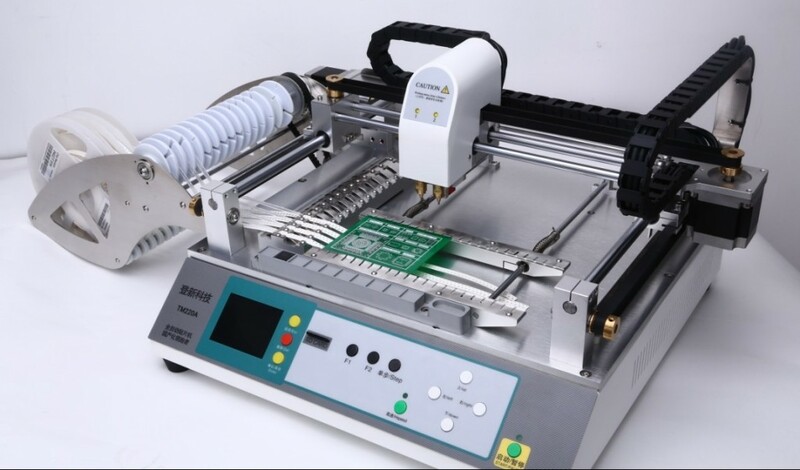 These boards use to take 30-40 minutes to place components by hand and to reflow on a hotplate. Now with this Quad IVc pick and place I can place all 128 parts in less than three minutes! Check out the video below to see how fast this process really is!